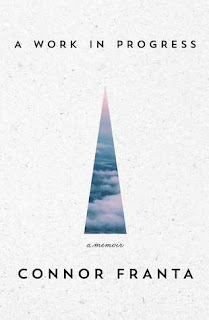 I have watched Connor Franta on Youtube for many years, so when I saw the video about him releasing his own memoir I was ecstatic. Connor has always inspired me and he certainly inspired me throughout this book. 'A Work In Progress' has got to be my favourite memoir I have ever read, not that I've read a lot of memoirs, but still. The way he talked about and described his life and feeling made me feel ready to be happy and to live life to the fullest. I don't think of myself as a very creative person, but to see Connor's perspective on how he thought about art and other things made me want to create. I also enjoyed how relatable and how much I connected with Connor and his thoughts throughout his memoir. This book made me feel happy and inspired to be creative and to live life to the extreme, to take chances and to get out of my comfort zone. I highly recommend reading this, even if you haven't watched Connor. I'm almost certain you will be absolutley glad you did when you're finished. It changed my outlook on how I view the world and also myself and I'm sure it could do the same for you. I can't really rate a plot or the characters so I will just give you my rating for the book overall.